High pressure cylinder 29 inches diameter. 150 p.s.i.g. 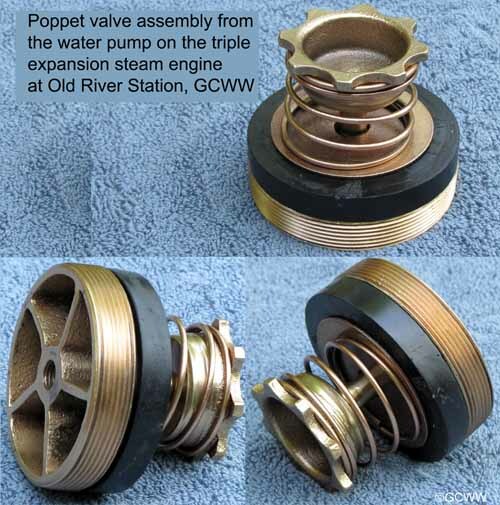 Steam valve gearing Corliss with dual chamber vacuum dashpot for the HP cylinder and the inlet to the IP cylinder. Piston speed 248 feet/minute or 2.82 m.p.h. Flywheel 2 x 24 feet diameter, 40 ton, assembled in sections and secured with dog bone locking keys. Preheat engine setting jacket steam and re-heater steam to 65 p.s.i.g. Begin oil drips 10-15 minutes prior to starting. Open engine drains to bypass steam traps. Adjust air pressure in both the suction and the discharge force chambers. 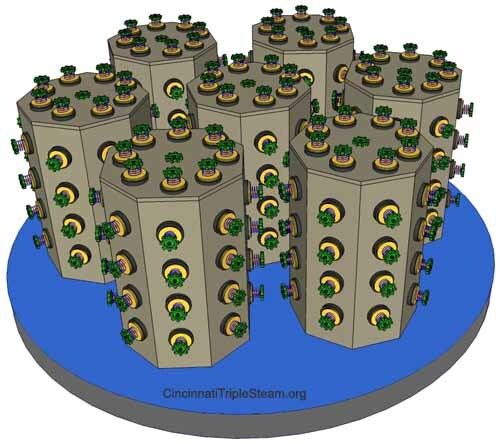 Load the water pumps using the bypass source until about 65 p.s.i.g. Open the main water inlet valve prior to opening main discharge valve. 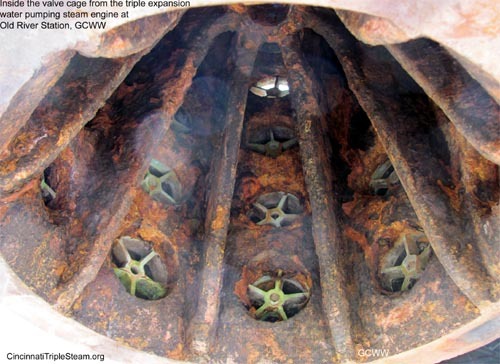 Later on cone valves replaced the gate valves and required verification of 200 p.s.i.g. water pressure for cone valve operation. Charging the first receiver to 30 p.s.i.g. steam. Slowly apply process steam to the HP cylinder until about -7 p.s.i.g. is achieved in the condenser and throttle back until the condenser achieves -13 p.s.i.g., and the governor has kicked in. If the HP piston is at dead center for crank-end or head-end, the overhead crane is used to nudge the flywheel off dead center. Close bypass to first receiver and adjust to about 22-24 p.s.i.g. Close drains and check for about -5 p.s.i.g. in the second receiver. Slowly bring engine to operating speed. In case of trouble or emergency, knock out the vacuum breaker and the engine will immediately stop. Stopping the engine in normal operating conditions required skill and practice to prevent the HP cylinder from ending at TDC. * Starting procedure from Stationary Engineer Jim Hoctor Sr. operating notes and input from Paul Kraus. 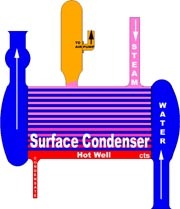 Condenser The attached surface condenser is located in line with the 48 inch discharge header with the entire water discharge passing through it. Heating surface of exhaust heater 150 sq. ft.
Boiler feed water pumps 2- Henry R. Worthington 10" x 6" x10"
Pump type Plunger, a nickel iron plungers replaced all the cast iron plungers in 1932. 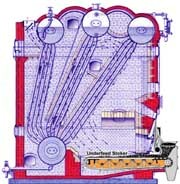 Boilers 9-Stirling water tube boilers, eight at 424 HP and one at 529 HP, plant h.p. = 4,500 in 1921. In 1906 the Stirling Company, with works in Barberton, Ohio, merged with Babcock and Wilcox of New York. Mud drum 42 inch X 9 feet 3 inches. 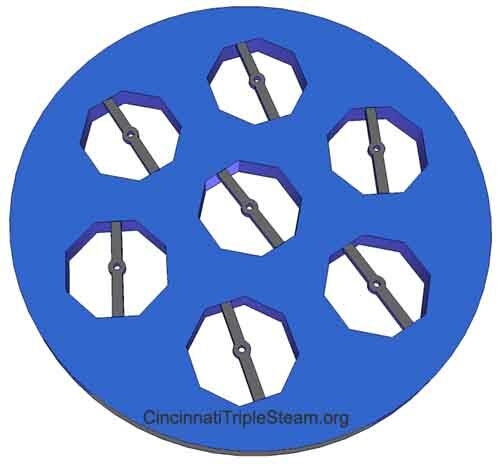 Fourteen inch pipe delivers steam to the engine room arranged to use either saturated or super-heated steam and branches into two lines with two engines taking steam from each branch. Exhaust steam from the LP cylinder flows through the exhaust heater into the condenser. 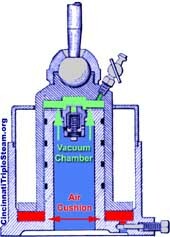 The air pump removed air, oxygen, CO2 and uncondensed steam from the condensate chamber while maintaining a near perfect vacuum (-13.8 psig) in the chamber. Auxiliary Hearer: exhaust steam from the ancillary engines flowed through a Berryman type boiler feed water heater and grease separator prior to entering the Green Economizer. Feed water from auxiliary engines Two 10 inch x 6 inch x 10 inch H. R. Worthington boiler feed pumps. Boiler House 60 foot X 180 foot, Oolitic* dimensioned Bedford limestone, exterior rock faced, and inside sawed smooth and rubbed. Boiler room floor of concrete, toilet room red American tile, office and store room was matched yellow pine flooring. Steel roof and lantern frame covered with vitrified** "S" tile. Individual lockers for all employee, toilet rooms with shower baths and other conveniences. **Vitrified Tile is a tile is created by the Vitrification manufacturing process which has very low porosity and water absorption, making it stain-resistant and strong. Smokestack 8 foot ID, 175 foot high of brick on circular stone base resting on a concrete foundation with a diameter of 35 foot and 8 foot deep. The stack is faced with light buff-colored radial Kittanning pressed brick and topped with a cast-iron cap. 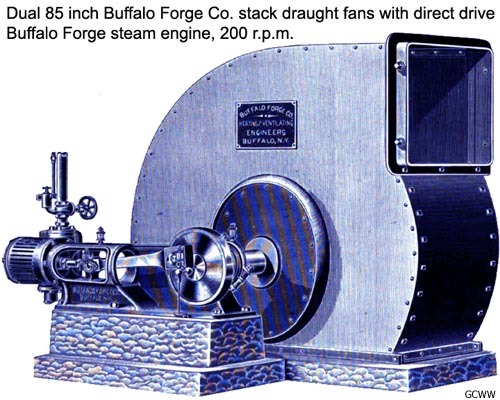 Forced draught was provided by two 8 inch by 10 inch Buffalo Forge Co. engines each direct driving an 85 inch Buffalo Forge Co. fan , nominal R.P.M., 200. An elevated steel building supported by steel columns, 69 foot X 225 foot kept the coal dry during periods of high water and provided sufficient coal storage for periods of low river level. 7,980 tons were stored in 114 elevated pocket hoppers each holding 70 tons, and equipped with a coal spout valve leaving 6 1/2 feet of head room above the narrow gauge tracks running lengthwise underneath the pocket hoppers. Coal was originally received by barge and occasionally by truck in the later days. A railroad siding had been extended to the coal bunkers to provide for rail delivery, but never use for that purpose. 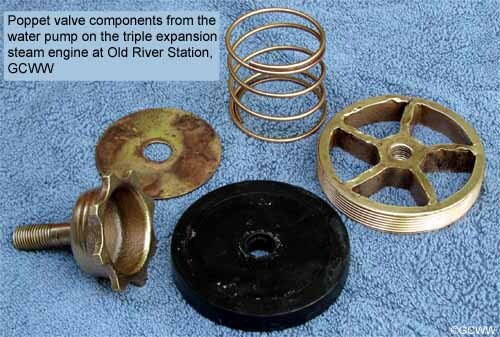 Coal was elevated from river barges via a dual narrow gauge rail system installed from low river water level to the top of the three story coal hoisting house using a steam hoist cable pull for dual two ton capacity steel dump cars (one traveled up while the other returned to river's edge) and deposited onto a cross belt conveyor, and distributed by means of shuttle belt conveyors to the 114 pocket hoppers. Boiler coal delivery (Coal Passers) Coal was switched to the boiler house from the coal storage building using a narrow gauge rail system with boiler charging cars powered by an electric locomotive engine about the size of a golf cart, called the "Dinky". Boiler ash cars were switched using the same locomotive. Coal was dumped on the floor in front of each boiler and shoveled into the stoker hopper using coal shovelers. 1924, an overhead rail suspended hopper system called the "Lorry" delivered coal to each stoker hopper and was supplied by a coal hoist in a new three story poured concrete lifting house at the front of the boiler house. Coal size Pittsburg Nut & Slack which is 1 1/2 inch and 3/4 inch respectively provided 13,000 BTU per pound of coal. Built by F. H. Kirchner & Co., of Cincinnati, the circular tapered, below grade wall, is 98 feet inside diameter and 85 foot high, using circular sawed Oolitic dimensioned Bedford Limestone* fifteen feet thick at the bottom and four feet thick at the top with the inside face being plumb and fine-pointed. Steel Casing A masonry embedded 1/4 inch riveted and caulked steel cylinder extending from the pit floor to 70 feet high assures a water tight pump pit. Foundation and caisson 128 feet diameter by 12 feet thick solid 12" x 12" air-dried white oak timber crib foundation rest upon the 7 feet high tapered-edge caisson cribbing using crisscrossed wood shoes with 21 excavation chambers. Caisson ballast 72 foot high with an OD of 23 feet and an ID of 13 feet, cast iron, 4,200 ton, Individual sections weighing 6 ton each. Three units, each consisting of a DeLaval steam turbine driving two 75 KW, 4 pole Crocker Wheeler, 230 volt direct current generators provided electricity to both river station and the filtration/treatment plant. 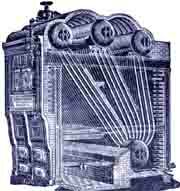 Warner Elevator Manufacturing Company from Cincinnati, Ohio provided a 2,500 lb. capacity, 230 Vdc motor driven elevator that traveled between the engine operating floor level and the pump pit floor level. Two spiral stair cases extended from the pit floor to the eccentric deck. A railed staircase extends from the engine floor to the wheel deck. The railing for all stairs and elevated walkways was bright work polished brass. From the Morgan Engineering Company, Alliance Ohio, provided a 3 motor circular traveling radial crane with a span of 49 feet 6 inches and a 30 ton lift of 110 feet. The electric motors use Morgan controllers with adjustable speed and direction controls. All motors are 230 Vdc and included a 30 HP hoisting motor, a 25 HP a bridge motor and a 5 HP trolley motor. The crane was ordered on April 26, 1901 by the Camden Iron works and shipped to the California, Ohio facility on November 18, 1903. Design of the engine and its pumps allowed every principal part to be reached and removed by the overhead hoisting crane without disturbing any other part of the machinery. Operations Three engines could be operated at rated capacity without increasing the regular daily staffing of 36 employees. The Station Chief was in charge of the entire operation while the licensed stationary engineer was in charge of the engine room and the licensed fireman was in charge of the boiler house . 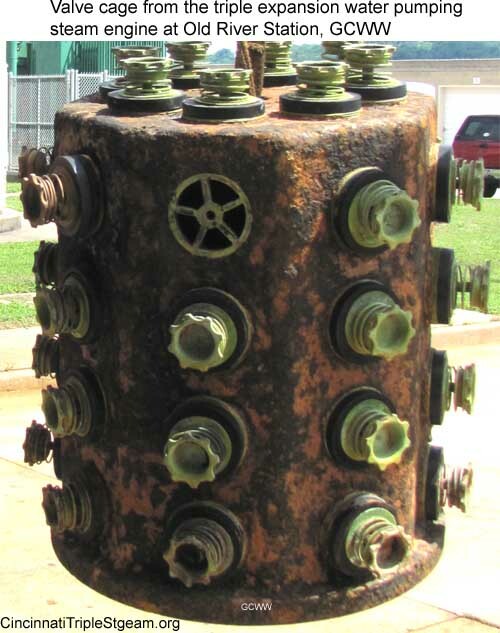 Each eight hour shift maintained a minimum staffing of one licensed stationary engineer, four oilers, one licensed fireman, two coal-passers, and an assistant Chief Engineer. Daily staffing include a clerk, one machinist and helper, one boiler cleaner, one locomotive operator, a janitor, and three or four grounds keepers..
2 - stack draught engines, Buffalo Forge Co.